The criminal justice field is growing quickly with an increase in available jobs. While competition in this field can be tough, candidates with advanced education and field experience can get an extra competitive edge in the workplace. Obtaining an online master's degree in criminal justice can place applicants first in line for these in-demand jobs, providing them with the advanced training and field experience they need to succeed as a criminologist, corrections officer, crime lab analyst or fraud investigator, among other exciting careers. 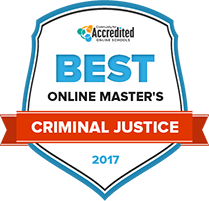 This guide covers everything prospective students need to know about enrolling and excelling in an online criminal justice master's program. Finding the right criminal justice program is a top priority for students looking to get a master’s degree in this growing field, but the right school differs for each student. High-quality programs feature comprehensive degree programs, good student-to-faculty ratios, and high graduation rates. The following highlights top ranked for schools with a criminal justice master’s program. The MS criminal justice degree program offered by Saint Leo is a fully online program, and offers increased opportunities in the criminal justice profession. Skills learned will deal with all aspects of criminal justice, including finances and management. In addition, there are several degree focuses students can choose from within the criminal justice program. Saint Leo is a military school, and offers some financial aid to graduate students when available. Career services are offered to students from enrollment until after graduation including access to the alumni network and assistance with resume building. Utica College offers a BS in criminal justice, with learning experiences both in the professional realm and abroad. Internship and other practice-based learning opportunities are available and required for graduation, and special focus is given to international issues. The program is designed to prepare students for further education, while still giving students ample opportunities to learn employable skills and knowledge. Online resources are available for students, as well as on-campus support services, organizations, and multi-cultural support events and organizations. A large number of Utica’s students receive financial aid, including a list of scholarships. Students can graduate with either a master of science in criminal justice or a master of science in criminal justice leadership and management. Both programs consist of 36 credit hours. The leadership and management degree is designed for students currently working in mid-management positions in the field of criminal justice who are seeking career advancement. The standard criminal justice masters is for students who are pursuing careers in corrections, law enforcement, social services or securities. Degrees earned online are identical to those earned by traditional, on-campus students, and all online degrees are accredited by the Southern Association of Colleges and Schools Commission on Colleges. National University's Master of Criminal Justice degree is fully online. Criminal justice training at National University prepares adults to meet requirements associated with corporate security, military security, police, prison officer and probation roles. Administration in criminal justice, how to encourage and help develop civil rest, understand court decisions and how to conduct criminal justice research are other functions that the degree prepares students to complete. Theory and applied knowledge are program cornerstone's. There are eight core courses in the 36 quarter credit hour program. Examples of these courses are comparative criminal justice systems, violence and victimization and advanced research methods. The criminal justice master's degree at the University of New Haven can be completed 100 percent online. Courses are condensed into periods of six-and-a-half to seven weeks, meaning all 36 credits can be completed in two years. Graduates will be qualified for careers in the FBI, the Department of Homeland Security, the Department of Justice and the Federal Bureau of Prisons. The university invites prospective students to watch a virtual information session about the master's program, which combines academic theory with real-world applications. The University of New Haven has compiled a vast menu of resources designed specifically to help criminal justice students. In addition to awarding the Master of Arts in Justice Administration and Public Service, the College of Saint Elizabeth operates a Police Studies Institute. Through the institute, current public safety workers discuss public policies and receive advanced leadership educational training. Master's degree classes are designed for adults with deep interest in law enforcement or existing criminal justice or public safety work experience. Areas that master's degree classes spotlight include social justice, community safety, law enforcement and court systems. Documents needed when applying for the master's degree include an application, personal statement, recommendation letters and a resume. Applicants must also complete an interview. The master of science in criminal justice administration program focuses on management, research methods, program evaluation and personnel administration. Graduates can go onto law school or careers that include homeland security, law enforcement, corrections and private security and investigation. Concentrations include law enforcement, corrections and a hybrid program, as well as an online program for distance learners. Most students will finish the program in 18 months to two years, and all students must finish in fewer than five years. Coursework is designed to promote critical thinking and the ability to apply theoretical knowledge to criminal justice applications. Roger Williams University's School of Justice Studies awards a Master of Science in Criminal Justice. Policing is only one area that instructors focus on in class. Crime causes, juvenile and adult court systems and community based correction options are other areas that instructors cover. Adults who want real life criminal justice training before they graduate with the master's degree can participate in an internship. Additional program outcomes include strong critical thinking, reasoning and analyzing skills. Continued criminal justice education is provided through the university's graduate cyber security, public administration and legal studies and law programs. Option to earn a graduate criminal justice degree at Tiffin University starts in the university's School of Criminal Justice and Social Sciences. Adults who currently have a bachelor's degree could earn a Master of Science in Criminal Justice. Specializations that criminal justice majors can declare are in crime analysis, homeland security, criminal behavior, forensic psychology and justice administration. More than half of the master's degree can be completed online. As the program advances, lectures are complemented with conferences and guest speaker appearances. The school also operates a center for cyber-defense and forensics and a center for justice and social and behavioral research. Students who graduate with a master of science in criminal/social justice degree will be able to join a variety of law enforcement organizations or advance their careers within their current organization. The faculty who teach the courses not only have doctoral degrees, but hands-on professional experience in several different fields. Lewis University and all of its master's programs are accredited by the Higher Learning Commission. Students will complete assignments according to fixed class schedules. Students are not, however, required to be online at any specific time of day. technical support is available at all hours of the day, as is student service support. It's never too early for students to get on the right track with their criminal justice master's degree program. During their undergraduate years, students need to focus on taking criminal justice courses and master's program pre-requisites, excelling in all of their classes, and making a good impression and connections with teachers and professionals who may be able to provide letters of recommendations down the road. Graduate level programs provide in-depth training and knowledge about the inner workings of the criminal justice system and the process of conducting high-level criminal investigations. The admissions process for an online criminal justice master’s degree program begins with successful completion of an accredited undergraduate program. Students must major or minor in criminal justice or complete studies in a closely related field. They must be prepared to submit letters of recommendation from professors that taught criminal justice-related classes and provide examples of success throughout their undergraduate program, whether this is was in the form of successfully completed simulation crime investigation projects or well-written essays and reports. Accreditation, the standards set to validate the education of a college, is very important when selecting a college to attend for undergraduate studies. Many criminal justice graduate programs will not accept a degree from a university or college that has not been accredited. Many online schools will only accept students into their master’s programs who have either majored or minored in criminal justice during their undergraduate career. However, a degree in a closely related field may be accepted on a case-by-case basis depending on the university. Additional coursework in criminology or criminal justice may be required for those who graduated with a major outside of the field. Online colleges and universities generally set a minimum GPA requirement for admission to a master’s degree program. If a student does not meet the requirement when they send in their undergraduate transcript, this can pose a major challenge to getting accepted. Students can attempt to retake general education or criminal justice major courses for better grades before applying to master’s programs if necessary. Letters of recommendation are important for student to acquire when applying into a master’s program in criminal justice. Most programs will require at least two letters of recommendation in the application packet. Letters should come from professional and applicable sources, such as professors from criminal justice courses or supervisors from corrections, criminology, law enforcement and similar jobs and internships. A GRE score is typically required for admission to a master’s program, including for online schools. This graduate-level standardized test is designed to score students on their general knowledge in verbal reasoning, quantitative reasoning and analytical writing. Some criminal justice master’s programs may set minimum test score requirements for applicants. In their first year, master’s students take a series of core classes that cover the foundations of criminal justice and pave the way for specializations, such as criminology, research methods and statistics. After completing core online courses, students can move on to classes in their chosen concentration. Advanced concentrations in criminal justice include criminology, corrections/rehabilitation, forensics, homeland security and law enforcement. Students may need to choose between completing a thesis, taking a comprehensive exam, or pursuing an internship to meet graduation requirements for an online master’s. For criminal justice students, graduation requirements will usually need to be related to a student’s chosen concentration. Students must take advanced courses that delve deep into core subjects and teach students how to use research methods and statistics to analyze and solve problems. They will work through real-life examples in criminology, forensics and corrections with a series of advanced courses, seminars and even workshops that provide hands-on training when needed. Completion of an intensive research project or capstone course is an important element of many online master’s degree programs. This research project may focus on a specialized area, such as criminal justice policy or practice where students must use advanced research methods, statistics, and planning and management skills to solve a problem and illustrate exactly how they solved the problem. To obtain a complete understanding of the social and legal aspects of crime needed for a career in criminal justice, online students must complete a list of general requirements before graduation. Students will have to complete the minimum unit requirement before graduating from their master’s program. The course load differs for each university but generally lies around 30 credits. Many schools require a comprehensive exam to be completed at the end of the degree program based on what the students learned in their core criminal justice classes. It will cover skills such as professional writing, criminology, criminal policy and correctional theory. An alternative to the end-of-coursework comprehensive exam is to enroll in the thesis track. Students in this track will develop a thesis based on existing research or theory. Through the completion of their thesis, students will be required to demonstrate graduate-level skills in criminal justice studies. Some online criminal justice master’s programs may require students to complete a set number of internship hours that count towards their credit hours. Other schools consider internships an optional part of the program, that can provide hands-on field experience for e-learners. Graduates of an online criminal justice master's degree program can explore a number of attractive career paths in areas of criminology, corrections, rehabilitation, forensics, homeland security and law enforcement. Whether they want to work as an FBI or CIA agent or in a lab setting as a criminologist or researcher, an online criminal justice degree can prepare the student for a rewarding career in their field. Responsible for studying the nature of a crime and working with law enforcement agencies and other organizations to investigate a crime scene. They are primarily responsible for conducting extensive research to draw conclusions about why the crime occurred. They use statistical and analytical methods to solve real-life problems and their reports may be published in journals or associated publications. Forensic scientists and technicians provide assistance in criminal investigations by collecting and analyzing different types of evidence, including chemical, biological and physical evidence collected at a crime scene. Technicians are usually tasked with writing detailed reports about their findings. Working closely with law enforcement agencies and private firms, these analysts retrieve pertinent information from a computer network that may have been hacked or corrupted by a virus. They may also be involved with examining data stored in electronic devices as part of a criminal investigation. Emergency management directors, are responsible for preparing plains and procedure to report natural disasters and other emergencies. They may work closely with government agencies and public safety officials to ensure everything is documented accurately and to coordinate the dispatch of emergency services personnel and emergency response teams. Learning how to analyze evidence, interpret results and make effective decisions based on these results is critical for success in this field. No matters what career path they choose in this field, students need to have strong critical thinking and analytical reasoning skills to solve crimes and prepare reports. Those working directly for Homeland Security as a secret service agent, CIA officer or similar role learn how to implement effective policies and procedures to increase public safety. Criminal justice master's degree programs provide students with the knowledge and training they need to implement these types of policies. Forensics is a specialized area of criminal justice but all students completing an advanced degree program in this field learn the basic skills and protocols to conduct forensic research projects. This involves analyzing different types of evidence based on fingerprints, digital footprints, and residue. This organization focuses on the specialization of forensic sciences and pushes to promote science within the legal system. The ACA seeks to draw professional members whose goals are to collectively improve the justice system. The APPA operates within a specialization of criminal justice and is involved in the implementation of criminal justice in the areas of parole and probation. This international network of female police officers and law enforcement professionals informs members of training and volunteer opportunities and provides professional support. The NABCJ seeks to achieve equal justice for African-Americans and other minorities by improving the administration of justice.